The old lifeboat station at Temple Pier in Drumnadrochit was recently given a new lease of life for the 12 strong crew of the RNLI. A new training facility and changing room were built close to the current base. The site needed two new boreholes which were installed by Geotechnical Exploration Services (GES) which would receive pipework for ground source heat pumps. The works were carried out using our new MI8 H Drilling Rig and TMAC wheeled compressor. Prior to the commencement of the work all the boreholes were clearly marked and checks carried out to ensure they were clear of all underground services by the client. 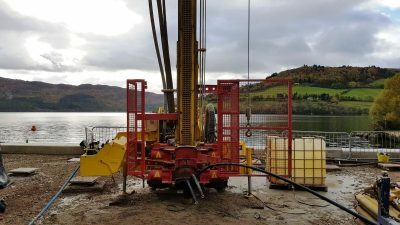 Environmental constraints stipulated that all water ejected from the borehole had to be double filtered before it could be discharged back into the loch. Drilling work commenced with our 6” Symmetrix system down through the over burden onto competent rock 21 metres in depth. The boreholes were then progressed with a 5” down the hole hammer (DTH). The flush medium was controlled through a diverter (Stuffing box) which enabled the control of the ejected water from each borehole through a network of hoses. The hoses were connected to a set of circulation tanks where the larger drilling cuttings were allowed to drop out. The end circulation tank was fitted with a pump which sent the water through a double filtered silt buster producing clean water. This met environmental expectations and allowed the water to be transferred back into the loch. The 2 boreholes were drilled, installed and tested in a timely fashion and all work on site was carried out in clean conditions in a controlled manner. Each borehole was then tremmi grouted from the base using a Putzmeister high pressure grout pump and thermally enhanced grout. Installation material was supplied by Go Geothermal who are an approved supplier to Drilcorp GES. Drilcorp GES have recently invested in a new drilling rig MI8H and two new hydraulic loop installers to meet the ever growing demand of the geothermal market. Ground Source Heat Pumps are an excellent method of renewable heat if installed correctly and by an approved supplier of the Ground Source Heat Pump Association. A ground source heat pump can lower your energy costs by up to 80% compared to direct electricity. You can also enjoy an environmentally friendly, renewable and a free energy source that minimises your CO2 emissions. Ground source heat is pure, stored, solar energy that is retrieved from deep in the ground, the bottom of a lake or a few metres below the lawn.